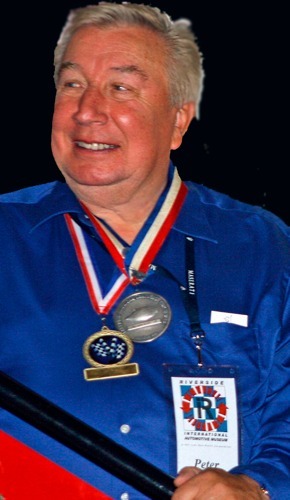 Riverside International Automotive Museum (RIAM) established an annual award which honors the memory of the late motorsports engineer/designer Peter Bryant. The inaugural presentation of the award will take place during “Legends of Riverside II” racing film festival and gala at the museum over the weekend of March 26-28, 2010. Peter Bryant was proudly enthusiastic about his life’s work in motorsports. His autobiography “Can-Am Challenger” (published in 2008) is a true textbook of tenacity. In the well-written book Bryant reels off the colorful story of how he worked his way from shop sweep-up boy to successful and universally-respected race car designer. His work ethic was remarkable, fully matched by a wicked sense of humor, and, as he would never fail to mention (or air out at the slightest provocation), a wonderful singing voice. Peter Bryant, quite literally, spent the last weekend of his life in the company of hundreds of friends both new and old. Taking part in the first Legends of Riverside event last March, Bryant was much in demand and always in the limelight for all three days. Signing books, posters, chassis drawings, and generally holding court every time he sat down, he was truly in his element. His untimely death at 71 years old, only a day after he got home to Las Vegas from the Riverside celebration, was more than a shock, it was a sharp blow to the solar plexus. Smiling, ebullient, Peter Bryant who had been so much a part of the first-ever Riverside Legends event, was gone. The perpetual trophy itself consists of a unique hand-built, free- standing clear plexiglas and lexan vertical unit with titanium sheet fastened on by aircraft grade titanium bolts and aluminum rivets which has a 1/25th scale representation of the Bryant Ti22 Can-Am car affixed to it. The clear plexiglas base structure was constructed by the artisans at Plastic Fab & Forming in Walnut, California, an outfit far more used to producing spectacular lighting units for high end hotels and restaurants than one-off motorsports trophies. Two shapes reminiscent of the original car’s unique body styling are riveted to the main titanium sheet. Interestingly enough the sheet of titanium which was chosen for the trophy is a product of Timet (Titanium Metals Corporation located in Caldwell, New Jersey ) the same outfit that had originally provided the materials and technical support that made the Ti22 car so unique. The replica casting of the car that carried the Bryant name was made for the trophy by designer Phillipe de Lespinay, who was a personal friend of Bryant’s and who volunteered his time and talent to add a special touch to the unique trophy. The trophy’s title plaque reads: Peter Bryant Challenger Award Recognizing Excellence In Engineering, Outstanding Service, and Personal Dedication to Motorsports – Presented Annually In Celebration of the Life and Lifework of an Indomitable Spirit: Peter Bryant. As earlier indicated, the Bryant Trophy will be unveiled on March 27th at this year’s edition of the event that’s already known simply as “The Riverside Reunion”. This year’s honoree will see his or her name placed on the perpetual trophy which will stay on permanent display at the museum. Each year’s honoree will be presented with a personal memento of their win. Bryant left those who knew him with a sense that they had palled around with a great guy, one who was proud of what he’d accomplished, but who was even more excited about what he’d being doing next week. For those who never had the pleasure, his book is almost like spending a weekend with him. “Can-Am Challenger” is an elegantly-engineered tale told in plain talk by a justifiably-proud man. The annual Legends of Riverside event is a limited-attendance event (only 250 are available for the full three-day presentation). The small number of tickets sold assures attendees of personal contact with any of the close to 100 authentic motorsports legends and special guests on hand for the event. Adding to the experience are locally-catered lunches and dinners, along with the screening of a number of racing films, in some cases with the one or more of the film’s actual participants sitting right there watching along with the ticket-holders. For more information, visit www.legendsofriverside.com. I met Peter in 2007 at the Monterey Historics. I had just put a new, fairly large air dam on my Lola T-160. Peter ambled over and asked “Why did you put a barn door on your Lola?” I replied “I ran into a 2 for 1 sale on aluminum!” Peter cracked up. We talked for about an hour and in that time we became great friends. (I think Peter became friends with everyone he touched.) We saw each other several times after that and talked for hours each time. He was one of the most joyous livers of life I’ve ever met and I miss him terribly. Peter Bryant was my Father and I am very proud of his Great Accomplishments and I never got to realize how Brilliant my dad really was Its so sad that I never have gotten any closure on his last will and testament I have been and are now desperately seeking out my stepmom his widow Lois Bryant for 6yrs now anyone with any information on hi can contact her please pick up your cell phone and call me Paul Bryant  884-9008 any time and I would be so gratefull. Paul John Bryant January 12 2017 Peter Bryant Was my father and I am truly very proud of his Great Accomplishments and I Still a year since I posted my last comments have not gotten any closure on his last will and testament the cell phone that I had at the time unfortunately got stolen and the number was given to a female I don’t know my new phone number is (714) 341-3398 and my e-mail is superhandyman411@gmail.com I am still Desperately seeking out my stepmom Lois Bryant or my sister Elizabeth please if you have any information on how I can contact either one PLEASE CALL ME or drop me an email and I would be so very grateful.